Silver Creek high school golfer Taylor Sandal is turning up the volume off the course. LONGMONT — Every game has a tempo. With golf, there's a flow to each round. "I definitely try to keep a rhythm going," Silver Creek golfer Taylor Sandal said of her game. Sandal is one of four members that make up the Raptors' girls' golf team. While their numbers make them one of the smaller teams in state, it hasn't stopped the senior from setting lofty goals. "I'd love to make the cut for state this year, especially being a senior," she said. "It would be really great to break 90 this year. That's [also] been one of my goals." Sandal is able to keep a beat on the greens because of her cadence off. 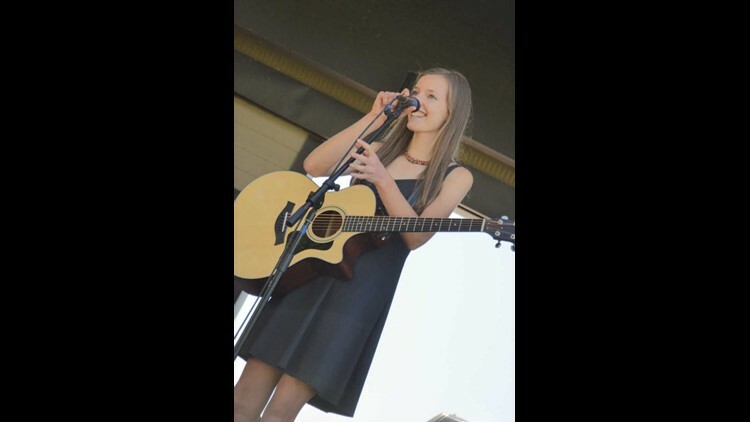 She's known as Taylor Shae on the stage, and music has always been a part of the singer-songwriter's life. "I actually draw inspiration from my own experiences, but also, what I observe from other people, and people around me," she said of her lyrics. At just 17-years-old, Sandal is already making a mark on the music industry. Just last month, she released her second album, "Twenty Paces." On top of her schoolwork and golf practice, she makes time to perform around the state, including at coffee shops, restaurants, breweries, festivals and private parties. Taylor's familiarity in the spotlight is on par with a crowd on a fairway. "You really have to prepare for the unexpected, because you never know what's going to happen when you're out on stage, or when you're out on the golf course," she said. "I'm just really trying to be in the moment and really try to give it my all." Her bluesy-Americana tone has already made headlines, too. Sandal has brought home multiple awards for both her songwriting and performances. In addition to her own personal music, she is a Colorado All-State choir member. Sandal will graduate this spring and has plans to attend Colorado State University in the fall, where she wants to study journalism. She says golf and music will always remain a central part of her life. "I want to be one of those people who's out on the golf course when I'm 80-years-old," she said. "I want to definitely keep doing music and keep writing songs and trying to share my music with other people." To see where you can hear Taylor perform next, visit www.taylorshaemusic.com. Her music can also be found on Spotify, iTunes, Apple Music, Amazon and Google Play.